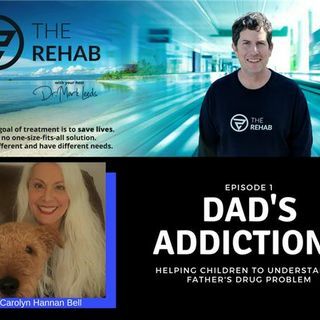 This episode of The Rehab features an interview with author and psychotherapist, Carolyn Hannan Bell. We discuss her most recently published book, "Dad's Addiction" and the topic of addiction and recovery. When a father uses drugs, it creates chaos in the house. How do children handle this? What can their mother do to help them understand that it is not their fault?Why is it so important that children understand that their dad's addiction is out of their control? Carolyn ... See More Hannan Bell has addressed this issue in her latest book, "Dad's Addiction". This wonderfully illustrated book is perfect for a mother to read to her children to help them understand what is happening in their home when dad cannot stop using drugs. It is critical for their development that children understand that they only have control over their own actions. There is nothing that a child can do to influence their father's addiction. It is never the child's fault. Carolyn Hannan Bell's book helps children to understand this. She is a practicing Psychotherapist in South Jersey. She earned her BA in Psychology from Duquesne University in Pittsburgh, and her MS in Counseling from Chestnut Hill College in Philadelphia. She often works with families and individuals suffering from the emotional effects of alcohol and substance abuse. This is her third children's book in her “Helping Children Understand” series. The First is “Daddy’s Disease” and the second “Mommy’s Disease” which were written to help kids understand parental alcoholism.